I'd like to use an Arduino Uno R3 battery powered a datalogger. I want do supply it directly with a Step-Up regulated 5V rechargable battery powersource at power pin 5V. I don't want to suppy it with 5V at the PowerJack or Vin because it's not necessary an would result in lower voltage when powered with 5V at Vin and unnecessary power dissipation at U1. Just supplying it at that pin 5V however might destroy the linear regulator U1 that regulates >5V+ Vin down to 5V, I fear. Is it acceptable and safe to suppy regulated 5V+ to pin 5V? Should I additionally short it to Vin? Unfortunately there's no internal schematic for U1 (NCP1117ST50T3G) in the datasheet. 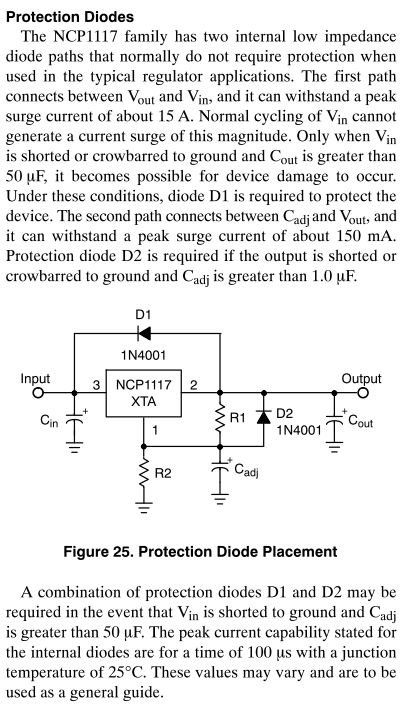 Take a look at the yellow area: am I wrong or is the protection diode reversed? Shouldn't it have the catode at USBVcc? As three answers state that it would be the safest way supplying the Arduino with regulated 5V though USB, let I should clarify my question a bit: I'd like to fit the setup within a small case, so I want to avoid plugging in a USB cable if possible. Except for testing purposes where this might happen by accident, it's not possible that Vin/VccUSB and Vcc 5V are available at the same time. Here's a less formal way to look at it: Providing power directly to the +5V pin is (almost) exactly what happens when the Uno is powered over USB. As USB power is perfectly fine, by design, then your setup should be OK too. External regulated +5V can be supplied to the USBVCC net just as well, for example by using an USB-B cable. As per the second question, you should not connect to V_in. NCP1117's output may then become an alternative, competing power-source and this is best to be avoided. That being said, supplying regulated 5 Volts to the VUSB connector (not broken out as a pin, AFAIK) should be the way to go: This is how the board is normally powered when running off an USB cable, so evidently the voltage drop is acceptable. Further, the only voltage drop to the +5V line when taking power from VUSB is the drop across the on-resistance of the FDN340P MOSFET, between 70 and 110 mOhms. For typical operations which do not involve driving high currents off the Uno, a current demand of 100 mA would result in a voltage drop of 11 mV, by a rough estimation. For a simple way to power VUSB, just liberate an USB cable by cutting it open, and apply the 5 Volts across the VUSB and ground pins. The target audience doesn't always understand how the schematic is designed, and as beginners/non-techs, would likey cause something bad to happen, like connecting an unregulated 5 volts to the 5V line, and blowing things, causing customer service calls/refunds/repairs/etcetera. Directly supplying 5 volts bypasses the auto-sensing/voltage protection method. Supplying 5 volts directly is easy. USB power practically does this, as does the ICSP protocol/header. USB has a 500mA PTC fuse on the line, and has a p-channel mosfet, which by themselves do not offer any protection. But there is also the LMV358 labeled U5A, above that mosfet. It is (half) an opamp, being used as a comparator. If VIN is detected, and higher than 3.3 volts, the opamp drives the line low, disabling the mosfet, cutting the USBVCC off from the 5V line. This makes it so that you can use VIN and USBVCC at the same time without problems. Otherwise you would have two power sources competing on the same rail (USB and the 5 volt regulator). It's part of the mosfet construction, internal, and functions as reverse voltage protection, preventing the 5V power rail from back flowing to the USBVCC. It is disabled when the mosfet is on, and reversed biased when off. DO NOT CONNECT USB AND YOUR 5V AT THE SAME TIME! By inputting a regulated 5 volts in at the 5V pin, you skip the helpful power source selection mechanism. You can just as easily connect your 5 volt in to the USB connector, or between the USB connector and the USB PTC fuse, but that will cause you to have a 500mA limit. If you need more current, you can bypass the fuse, but not the mosfet. DO NOT SHORT 5V to VIN! The 5 volt regulator in any case, will be just dandy, as long as VIN is not used. I think you should be fine. From the sound of the datasheet, the regulator has internal protection diodes that should easily be able to handle the capacitive loading present on VIN (from the look of it (and screw you, net labels and non-searchable schematic), the total capacitance across VIN is 47 uF). As such, even if all the capacitors on the board are fully discharged, the only current that will flow through the regulator's protection diodes is the current required to charge that single 47 uF capacitor. If you're really concerned, or want to be extra cautious, you can put a Schottky diode between the 5V pin and the Vin pin. This will prevent any reverse-current from flowing through the regulator (basically, this is the same as D1 in the above diagram). You could also simply jump the Vin pin to the 5V pin, and just feed 5V into the DC-in jack. Be aware that if you feed the arduino with more thn 5.5V, you will damage something. Another idea might be to connect a 2.2k resistor from +5v to the point labeled "CMP" which is the non inverting input to the op amp pin 3. This will disable the USB +5v power to the board but still allow USB communications. Of course a SPST switch to turn 'off' the resistor would be nice too so you could disable this new feature. The switch would be wired in series with the 2.2k resistor. If you never plan to use USB power again however the switch wont be needed, only if sometimes you have to power the board with the USB power with no external +5v power input. Whatever you do test to make sure it works by measuring the output of the LM358 when you connect the external +5v supply. Hmm, isn't this backwards? The voltage divider is connected to the non-inverting input of the comparator, and so drives it HIGH (+5V) when the divider voltage is above 3.3V, and LOW when it is below 3.3V. The P-channel enhancement-mode MOSFET is switched OFF when the gate voltage is HIGH (i.e. Vgs = 0V) and switched ON when the gate voltage is LOW (i.e. Vgs = -5V). The result is the same (a voltage above 3.3V at the divider turns the MOSFET off and isolates the USB power, and a low voltage at the divider connects USB power to the circuit) as the quoted paragraph states - but I think the voltages stated there are backwards. I think the best to do in that case is powering the arduino through +5V Pin from a 5V regulated source and, if ever needed to plug USB to code or print values to computer, use a USB cable with its 5V wire cuted off. That way you will never put your arduino in a power source fight neither. But you won't have its 3.3V pin workin. Right? !, because 5V rail do not go to 3.3 voltage regulator. Not the answer you're looking for? Browse other questions tagged arduino power-supply power voltage-regulator ldo or ask your own question. Rechargable Li-Po battery to power Arduino through ICSP header? Arduino getting supply from digital pin? How to use external power supply for Arduino Uno? Is a USB Charger a regulated supply? Help review my first arduino PCB: What did I do wrong?